See the hottest deals and the best prices online for free with Dealspotr. Their community embraces the power of sharing to drive real-time updates on savings across the web. At Dealspotr, it's their aim to become your go-to destination for deals and coupons. Every deal they list is checked and verified and at any given time their community of over 30,000 members is at work adding the over 10,000 deals and 100,000 edits performed daily. Instead of being driven by which brands are spending, Dealspotr is driven by what consumers think is a good deal, what consumers think is hot, and what consumers want to save money on. You can earn rewards and income for helping them improve their site by growing their community and sharing deals. Crowd votes determine what's hot at any given moment and you can earn points just by predicting which deal will be on fire on any given day by hitting the Spot button. Like Pinterest, you can create a customized feed based on your favorite brands, your interests, and the other Dealspotr members or influencers whose shares you enjoy. 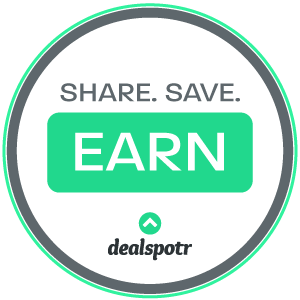 You can save money and earn points towards free gift cards with the Dealspotr community. Register now to predict the next hot deal, snag coupons, and have influence over how the online community shops.